Samsung Galaxy S III (SGS3) is the upcoming and most awaited successor of Galaxy S 2. 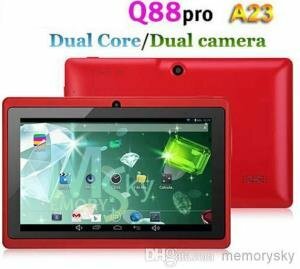 It is said that it’s built with even greater features compared to its predecessors. 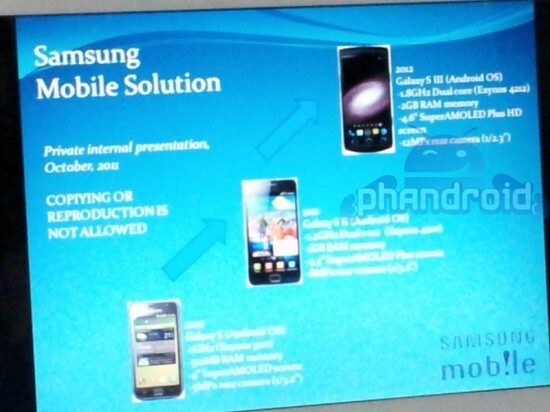 Just recently from Samsung Mobile Solution, an internal presentation held just this month was leaked, revealing the main features and specs of Samsung Galaxy S III. See the screenshot below. Based on the screenshot above, the Samsung Galaxy S III features 1.8GHz Dual Core (Exynos 4212) processor. The SGS3 has 2GB of RAM memory, 4.6″ SuperAMOLED Plus HD screen and a whooping 12 Megapixel rear camera. I can’t decipher the last portion. Hmm.. “SuperAMOLED Plus HD”? Maybe this should be “HD Super AMOLED”. That makes the Samsung Galaxy S III leaked information above even doubtful. It seems that the camera sensor is not only larger but also better. I think they included a new technology with their camera, like the one in iPhone 4S. The leaked Galaxy S III was revealed by Phandroid. We are also not sure if the new leaked information is authentic or not. There are things that are inconsistent resulting to one question after another. Samsung Galaxy S III is expected to be released by 2012 and will most probably run in the upcoming Android OS Ice Cream Sandwich. Most probably we will know if the information is real or fake when it is debut at Consumer Electronic Show (CES) and/or Mobile World Congress (MWC).